Now take the sentence Brynn will say whom she gave the cookies. In a Reed-Kellogg diagram, it would be very clear why the sentence requires whom instead of who: because whom is the object of the verb gave. And that would be equally obvious for Whom will Brynn say she gave the cookies?, precisely because the diagram would be the same. That’s grammatical for you? It isn’t for me. It needs a to: Brynn will say whom she gave the cookies to. (or Brynn will say to whom she gave the cookies, which is awkward, but still better, for me, than without the to). It’s grammatical because whom is an indirect object. She gave him the cookies does not require a to before him, which is the indirect object. Him and whom occupy the same grammatical position. [W]hen who or whom is fronted, to is required. For me. That is, for some of us. So I’m surprised to see it’s different for some people. The availability of the N[oun]P[hrase] Dative [i.e. give someone something] is apparently constrained by a huge number of factors, having to do with the semantics of the V[erb], the discourse prominence of the referents involved, the phonology of the V, the grammatical person of the NPs involved, the pronominal status of the NPs involved, and the particular V involved (with donate fine in the PP Dative but dubious in the NP Dative, for example). The key, he gave Sue. / ?Sue he gave the key. The key which he lent me didn’t fit the lock. / ?The one whom I lent the key didn’t return it. The starred or question-marked items are those that would sound better with a to. Huddleston and Pullum acknowledge that speakers vary in how bad they find the */? examples above, but “[n]evertheless, there is very widespread agreement that the [*/?] examples are significantly less acceptable than” the other examples. In other words, it’s better to use the construction that has a direct object and a to prepositional phrase if you want to front the recipient instead of the thing that’s transferred. Hence, the oddness of ?Brynn will say who(m) she gave the cookies, compared to the grammaticality of Brynn will say what she gave Fenster and Brynn will say who(m) she gave the cookies to. In a comment on his post, Zwicky provides links to a couple of recent papers on the dative alternation — a nice introduction to a syntactic phenomenon that, as he points out, has generated a huge amount of literature. This blog post illustrates the differences between the Reed-Kellogg diagram and tree diagram methods for diagramming sentences. I prefer the Reed-Kellogg method. 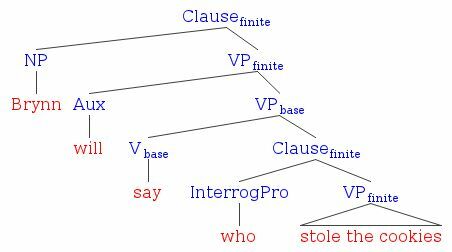 I know linguists prefer tree diagrams for their precision and more nuanced representation of sentence structures, but I’m not a linguist. I just want a visually accessible way for students to look at sentences, and (at least for me) the left-right reading orientation of the Reed-Kellogg diagram presents sentence structures more clearly than the top-down reading orientation of the tree diagram. I’ll respond to their two reasons. First, it’s true that if you’re a linguist, you probably prefer tree diagrams to Reed-Kellogg diagrams. It’s also true that if you’re a cat, you prefer meat to vegetables. But if you’re not a cat, that doesn’t mean you prefer vegetables to meat. Case in point: my son Doug, who is not a cat, yet still likes his pizza with pepperoni and bacon when he can get it, and will pick off any peppers or onions. Likewise, you don’t have to be a linguist to like tree diagrams (if you like diagrams at all). I respect Rentz and Lentz’s preference for Reed-Kellogg diagrams, but dispute their non-linguisthood as a valid reason for the preference. As for the “left-right reading orientation of the Reed-Kellogg diagram”, I’m afraid I don’t understand. One of the advantages of tree diagrams is that they preserve the linear order of an utterance. Reed-Kellogg diagrams use a mixture of left-right and top-down orientations, and if you don’t know the original sentence that is being diagrammed, you can’t always get back to it by reading off a Reed-Kellogg diagram. If you don’t believe me, check out this Reed-Kellogg diagram of the opening sentence from the Declaration of Independence, and then compare it to this tree diagram of the same sentence (you’ll need to use the magnifying-glass icon). Both diagrams are big and unwieldy, but only the tree diagram lets you read back the original sentence in unwavering left-to-right order. This willingness to undo a sentence’s linear order to get at its structure shows up especially in Reed-Kellogg diagrams of interrogatives. An interrogative like Do you like cats? in a Reed-Kellogg diagram is indistinguishable from the emphatic You do like cats!, because subject-auxiliary inversion (e.g. Do you) is ignored. Also, wh elements are always left in situ in Reed-Kellogg diagrams. That is, a sentence like What did you see? is diagrammed as if it were the question Did you see what? — or more accurately, as if it were You did see what?, what with the undoing of the subject-auxiliary inversion in Did you. That would be the question you might ask someone if they said to you, “I did see it!” and you didn’t know what the heck they were talking about. Brynn will say who stole the cookies. Who will Brynn say stole the cookies? In English, the who in these sentences is placed at the front of whichever clause is a question. If the question is about who stole the cookies, the who stays at the front of stole the cookies. If the question is about whom Brynn will accuse, the who goes in front of will Brynn say. But when you diagram it in situ, you don’t know which sentence you’re dealing with, and the semantic difference is more than just whether you’re asking about or stating the same proposition. In a language like Chinese, where all wh items really are in situ, the ambiguity of this diagram would be excusable, because the actual sentence would be ambiguous, too — but we’re diagramming English, not Chinese. In fact, the above diagram is even the same as the one for …who Brynn will say stole the cookies, but we can cut a little slack here, since this is a subordinate clause, not a complete sentence. A Reed-Kellogg diagram would have to connect situate this clause within a larger one; for example, Fenster knows who Brynn will say stole the cookies. It’s worth noting that only the first of these four English sentences can be read off the diagram left-to-right. A couple of other reasons I prefer tree diagrams can be seen in the diagrams in this post. First, it’s easier to collapse tree diagrams into triangles to hide the details. In the Reed-Kellogg diagram, even though I wasn’t interested in the internal structure of the verb phrase stole the cookies, I had to diagram it out, right down to hanging the the underneath cookies. In the tree diagram, I just took it down to the level of VP and left that phrase in a triangle of its own. Second, tree diagrams let you diagram a phrase without insisting that you diagram the entire sentence it came from. If I wanted to diagram just the structure of the predicate stole the cookies, I could do that easily with a tree diagram, whereas a Reed-Kellogg diagram would look incomplete with a predicate on one side of the vertical bar and no subject on the other side. I’m not saying that tree diagrams always have it over Reed-Kellogg ones. For some sentences, neither kind has an advantage, and for some, Reed-Kellogg might even have an advantage. For example, Reed-Kellogg diagrams do a better job than tree diagrams of showing the unity of phrasal verbs such as throw away when they wrap around a direct object. 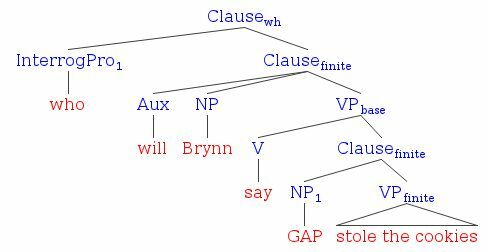 For many sentences, though, especially the kind that syntacticians think about and traditional grammarians tend to overlook, tree diagrams are the way to go. Let’s Hear Some New Grammar Songs! Helping verbs, helping verbs, there are 23! Have, has, had, do, does, did, will, would, shall and should. There are five more helping verbs: may, might, must, can, could! Helping verbs need to go with a main verb. But which form of the main verb is right? Can, could, shall, should, will, would, must, may, and might. Use the plain form with do, does, and did, too. Use the past participle with have, has, had. Use the –ing form with all of your be verbs. When you know your verb forms you’ll be glad. This last verse tells about a complication. Sometimes past participles can go with forms of be. When they do, it’s a big change in meaning. Who’s performing the action is key. Helping Verbs and Main Verbs by Neal Whitman is licensed under a Creative Commons Attribution-ShareAlike 3.0 Unported License. Between now and 11:59PM November 14, take an existing melody and write some new lyrics for it, explaining some area of English grammar. Post the lyrics in a comment, giving the title of the original song and your new title. If you wish, you can make a video of the song and link to it. Grammar topics can cover the same areas as existing songs about English grammar, or present topics that haven’t been put into song yet. Be linguistically responsible. Prescriptive rules are OK (they’re what this contest is about), but make sure they’re in line with what good writers actually do when writing in standard English. For example, saying that the third-person singular present tense is formed with an -s or -es suffix is OK, but saying that whose is only for animate or human referents is not. Don’t give me something you already published, on the Internet or elsewhere. I want this contest to generate some new and hopefully useful teaching resources. I’ll wait until it’s November 15 all over the world to make the cutoff, and the writers of the two best songs (in my judgment) will each receive a copy of Grammar Girl’s 101 Words to Sound Smart (thanks to Mignon Fogarty for providing them!). As far as I’m concerned, you retain all rights to your song, but in the spirit of making new teaching resources available, I hope you’ll put them under a Creative Commons license, as I did with mine. Songs whose melodies that are in the public domain. Songs linked to a video. So let’s hear your grammar songs! If you need some inspiration, allow me to suggest “The Forgotten Helping Verb”. Grammar Girl has yet another book coming out this week, in what looks like it’s becoming a franchise: the 101 Words series. Back in August, I gave away a copy of 101 Words Every High School Graduate Needs to Know and 101 Misused Words You’ll Never Confuse Again, and in the next few days I’ll be running a contest to win a free copy of the latest one, 101 Words to Sound Smart. More on that in a subsequent post. Today, I’m interested in the syntax of that title. Some infinitival phrases that modify nouns are like relative clauses, because they have to have a “gap” that the noun is understood to fill. Indeed, they’re sometimes called infinitival relative clauses. For example, there’s this title of a book full of blank pages and prompts for artistic inspiration: 642 Things to Draw. The transitive verb draw is missing a direct object, and things fills this gap. For an infinitival relative clause with a subject gap, how about Tales to Give You Goosebumps? The verb phrase give you goosebumps doesn’t have a subject, but it’s understood that the tales will handle the task of giving you goosebumps. The gap could even be the object of a preposition, as in Stories to Curl Up With (a title I made up), in which the stories are the things with which someone could curl up. But in 101 Words to Sound Smart, there is no gap. There’s no gap in the verb phrase sound smart. There’s no subject gap, either, unless the meaning is that the words themselves sound smart. I suppose that could be one way to parse the title, using smart in its extended sense of things that smart people use (the same way stupid can refer to things that only stupid people would like, and similar cases). But I think that if that’s what Grammar Girl meant, she would have called it 101 Words That Sound Smart, making it more of a certainty. The infinitival relative conveys more of a sense of potentiality: things that you could draw, tales that could give you goosebumps. The meaning that I’m pretty sure the title is intended to convey is that these are words that you can use in order to sound smart. In other words, to sound smart is a purpose infinitival. These are much more common as modifiers of verbs than as modifiers of nouns. In fact, when I first heard this book title, I would have said that purpose infinitivals couldn’t modify nouns. I would have said that words to sound smart was ungrammatical, and that the only ways to get at that meaning of purpose would be to use an infinitival relative clause. One way would be with an object gap, as in 101 Words to Sound Smart by Using. That sounds really awkward, though; maybe even ungrammatical in its own right (because of so-called relative clause islands). So a better option would be with a subject gap: 101 Words to Make You Sound Smart. However, a few days after I encountered words to sound smart, I was looking at the cover of Family Tree magazine (my Aunt Jane is really into genealogy and got me a subscription), and saw the teaser for one of the articles: websites to find your ancestors. You could take this to mean websites that will find your ancestors for you, but it’s actually talking about websites that will help you find your ancestors. In other words, it’s another purpose infinitival modifying a noun. As I was looking over this post, I noticed the phrase contest to win a free copy, with a purpose infinitival following the noun contest, and it sounds completely normal to me. My gut feeling is that the infinitival is a complement to the noun, and not a modifier, but I haven’t thought about it enough to be certain. Anyway, nouns modified by purpose infinitivals, are hard to search for in corpora, because you can’t conveniently look for entire infinitival phrases that contain no gaps. For that reason, I don’t know how common this kind of construction is; all I know is that it’s unusual to my ear, but that it must not be too strange for others. How do they sound to you? Reactions and additional examples are welcome in the comments. Knowing, as you do, about the literal-minded tendencies that people with ASDs often have, you’re probably imagining this kid objecting that he wasn’t hitting himself. But he didn’t. He got the intended message just fine. That’s because he had had the good fortune never to have been beaten up, hadn’t seen people getting beaten up, simply hadn’t had the right kind of experiences tagged with the verb beat up to have that as its literal meaning. As far as he was concerned, “criticize harshly” was the literal meaning. No one was the wiser until he came home from school a couple of times with stories of how “my teacher beat me up today.” Luckily, they got that resolved before police or social workers got called in. The tendency is to beat yourself up with a 125-or 150-mile ride, then take the next day off. You have to be in great shape,’ he says. You beat yourself up every week. We use a lot of ibuprofen and Gatorade. Before, I’d do hill repeats and beat myself up until I was ragged and then recover in a few days…. From the top, skiers look across into the glaciers of 11,000-foot Marmolada, the tallest peak in the Dolomites, and back down into challenging runs toward Arabba. After beating ourselves up on these steeps, we barely had time to zip through our fourth valley of the day, Canazei, and get back to Val Gardena at sunset. I have to think every night like I’m a prizefighter going out on that stage, that it’s going to be the last fight. You’d think, why would I beat myself up like that after 25 years? Woman 3: Thank you. How can you beat yourself up with concrete and not realize you’re hurting yourself? Even though it’s a different personality, it’s the same body. A man beat himself up and got arrested for it about 10:30 Sunday evening. He is 21 and was very intoxicated and unruly, a witness said, when he began hitting himself in the face with his fists. So reflexive beat up can have a literal meaning after all; in this corpus, it happened 5.3% of the time. Now, what about beat up with non-reflexive pronouns? Does it ever occur with a figurative meaning? HANNITY: I thought the speech was extraordinary well delivered. I thought it was eloquent at times. I thought he hit the right pitch and the right tone. That surprises you? WILLIAMS: I’m speechless. I’m not allowed to be speechless. But basically, you know, I mean you beat him up a lot, so yes. Ms-IVEY: Well, I think Taryn really is just backpedaling now because she knows Dani and I were going to beat her up in the elevator. MARTIN: No violence. (Soundbite-of-laugh) MARTIN: This is a civil zone. In politics, when you fail, it’s like the end of the world because the press keeps piling on you and beating you up and all of those kind of things. That’s three out of 25 examples, for 12% figurative. Just today, I also heard a broadcaster talking about politicians “getting beaten up” in the news, which is a reminder that transitive beat up can be passivized, too, so you also have to check for figurative meanings there. COCA returns 494 examples of beaten up, and I’m not going to check all those out, either. And never mind all the examples of beat up with non-pronoun direct objects, which I’m also not going to check. But from the searches I did do, it looks like beat up with non-reflexive direct objects really is used for the most part in a literal way, though it ventures into figurative territory more often than reflexive beat up goes literal. I don’t recall having come across other verbs that tended to have literal vs. figurative meanings corresponding (more or less) to reflexive vs. non-reflexive uses. Other examples are welcome in the comments. Jessica Hagy’s webcomic Indexed makes frequent use of Venn diagrams. This one from July has the sets Nouns and Verbs intersecting in a set labeled Heinous Business Speak. So, according to this diagram, every noun that can be used as a verb or verb that can be used as a noun is an example of heinous business speak. This would mean that (as one commenter hinted) speak is heinous business speak, as are run, walk, and swim. Moreover, this diagram states that every example of heinous business speak is something that is both a noun and a verb. This would mean that going forward, at the end of the day, think outside the box, and pick the low-hanging fruit are not heinous business speak. They may be heinous, or they may be business speak, but not both. I know, I know, it’s just a frickin’ joke; why don’t I have a sense of humor? Part of the humor of using technical language, concepts, or methods for silly things is doing it accurately. When Tom Lehrer put the names of all the known elements to the tune of “I Am the Very Model of a Modern Major General,” it was funny because he didn’t make up stupid element names; he used real ones, and all of them that existed as of 1959. When the Roman guard corrects Brian’s Latin grammar, it’s funny not only because we don’t expect that as a reaction to an act of graffiti, but also because Romanes eunt domus really should be Romani, ite domum (at least in Classical Latin). As the saying goes, “It’s funny because it’s true.” Furthermore, Jessica Hagy is contributing to a sloppy understanding of various math concepts by people who laugh at her comics but aren’t entirely clear on how Venn diagrams work. xkcd pulls this kind of thing off better. What gets me is that now people are using the phrase “Thank You much” instead of “Thank You very much” or just “Thank You.” It just sounds so wrong and annoys me every time I hear it. It just sounds lazy – they’re obviously so appreciative that they can’t put the effort into a complete sentence. “Thank you much.” is not correct English. You can say “thank you very much” or even “thank you so much”. “Thank you much” IS a complete sentence, at least if you accept “Thank you” as a complete (albeit noncanonical) sentence in the first place. If you object to “much” instead of “very much”, note that it appears alone in questions and negative sentences, e.g. “he doesn’t talk much”, “Does he talk much?” If you’re objecting to the use of plain “much” outside these “negative polarity contexts”, that’s a different matter, because that does sound odd in present-day English. Suppose the commenter really was objecting to this use of unadorned much as a positive polarity item (PPI). In fact, there are times when PPI much sounds just fine without a very. It can modify comparative adjectives or adverbs: much better, more more quickly, etc. It also works if it has a too before it: I ate too much. North Korea’s ability to launch another conventional ground invasion is much degraded from even a decade ago. And of course, there’s this song from Janet Jackson, though you could argue that she chose the title in part to make her listeners pause for a moment. So maybe the commenter is not trying to make any wider claim about the usage of much; it’s just that when it appears after thank you, for whatever reason, there has to be a too or a very. Well, what do you think? Is it actually ungrammatical, or just somewhat old-fashioned sounding to say Thank you much? If you believe it’s ungrammatical, let us know why in the comments. First of all, I think I have a pretty good handle on the currently standard system for English conditionals. I wrote about them most recently in July in this post. In my grammar, a sentence like If I sit here, my pants will get wet suggests that me sitting here is a possibility that I’m considering (though I may be leaning toward rejecting it). The past-tense form sat in If I sat here, my pants would get wet suggests that I’m not seriously considering the possibility. Second, I got straight many years ago on the workings of lay and lie–though I’ve also learned that lay and lie have flip-flopped and varied in their usage over the centuries, and that it’s more or less accident that the system currently considered standard was settled upon. This Grammar Girl piece lays it out (get it?) pretty clearly, with a nice diagram. This Language Log post goes into more detail. For what it’s worth, I say lie in the present tense, lay in the past tense, and lain in the perfect tenses to talk about being recumbent. (Or lied if I’m talking about telling untruths.) I say lay (something) in the present tense, laid (something) in the past tense, and lain (something) in the perfect tenses to talk about putting something down carefully. At least, I think I do. Even though I am accustomed to hearing past-tense verbs in if-clauses to introduce remote conditions, and even though I accept lay as the past tense of lie, I still, still, just can’t parse these lyrics as the hypothesis and conclusion of a remote conditional. Instead, I find myself just figuring that the singer uses both lay and lie to mean lying down, sometimes saying one (“If I just lay here”) and sometimes the other (“Would you lie with me?”). Why is that? Would you sit with me and just forget the world? With sit/sat, I have no problem getting a remote-conditional reading. The Master of Grammar got tripped up on these lyrics too, and publicized his misunderstanding in this blog post. Three commenters set him straight, but I take the difficulty of getting this parse, even among the grammar-savvy, as a sign that the lay/lie distinction is on its last legs. I’ve just watched the video, and every time the singer gets to the refrain, he’s lying on something: twice on a bed, once on some asphalt, and once at the top of a subway escalator. He’s not standing up and thinking about lying in some location; he’s actually doing it. He even lies on a slab of rock during one of the verses of the song, so clearly, lying down in even the most unusual locations is not such a remote possibility for this man. What do you think? Is If I lay here being used in a standard or nonstandard way in “Chasing Cars”?